Control your lights and appliances with your smartphone from anywhere. There’s no hub and no monthly fees, no crazy configurations – Just Wi-Fi and WiOn. 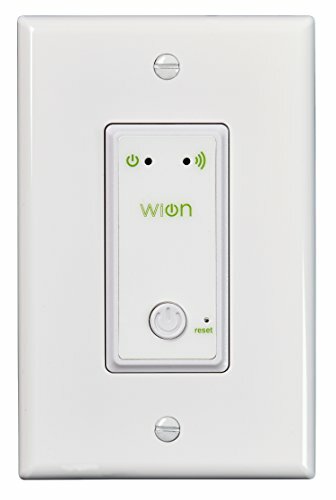 With the WiOn indoor switch you can program your porch light to turn on at sunset, turn the bathroom fan off after selected time, schedule the ceiling fan to be on so you come home to a cool house, or set lights to randomly go on and off for an occupied appearance while you’re on vacation. Simple control, all at your fingertips. WiOn smart plugs, wirelessly connect all of your favorite devices using our simple, feature-filled products. You can even expand your system to include multiple indoor and outdoor smart switches, which do anything from lighting the front porch to turning on and off outdoor holiday decorations automatically. With WiOn, wirelessly updating your home is simple. Read all instructions before using the WiOn Wall Switch. Installation should be made by a licensed electrician. The screw terminal accepts 14AWG-12AWG wire. It’s recommended that the wire gauges be the same for screws to tighten properly. Refer to installation instructions for full details. Support for WiOn is available at 1-800-561-4321.